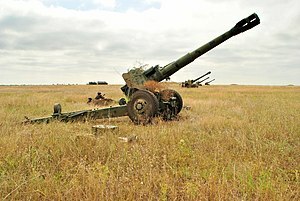 The 152 mm gun-howitzer M1955, also known as the D-20, (Russian: 152-мм пушка-гаубица Д-20 обр. 1955 г.) is a manually loaded, towed 152 mm artillery piece, manufactured in the Soviet Union during the 1950s. It was first observed by the west in 1955, at which time it was designated the M1955. Its GRAU index is 52-P-546. 152 mm has been a Russian calibre since World War I, when Britain supplied 6 inch Howitzers and Russia purchased 152 mm guns from Schneider (probably derived from the 155 mm Gun Mle 1877/16) for the Imperial Army. The new gun-howitzer, was a replacement of the pre-war ML-20 gun-howitzer (the 152 mm howitzer M1937) and various World War II era 152 mm field howitzers, Model 09/30, Model 1910/30, Model 1938 M10 and Model 1943 D-1. By Soviet definition, a 152 mm howitzer is ‘medium’ calibre artillery. It was designated a ‘gun-howitzer’ because its muzzle velocity exceeded 600 m/s, and its barrel length exceeded 30 calibres. It equipped battalions in the motor rifle division artillery regiment and army level artillery brigades. The design, which was probably initiated in the late 1940s, was first seen in public in 1955. It was designed by the well established design bureau at Artillery Plant No 9 in Sverdlovsk (now Motovilikha Plants in Yekaterinburg) led by the eminent artillery designer Fëdor Fëdorovich Petrov (1902–1978), who was responsible for several World War II pieces. The gun's factory designation was "D-20". The carriage is the same one used for the D-74 122 mm Field Gun. The barrel assembly was the basis for the D-22 (GRAU index: 2A33), which was used for the self-propelled 2S3 Akatsiya ("Acacia"). The D-20 has a 34 calibre (5.195 m) barrel, with a double baffle muzzle brake and a semi-automatic vertical sliding-block breech, with a tied jaw and the block moving down to open. The barrel is mounted in a long ring cradle with the trunnions just forward of the breech. The recoil system (buffer and recuperator) is mounted on the cradle above the barrel. Compression balancing gear is attached behind the saddle support, passing through the complex shaped saddle to connect to the cradle just forward of the trunnions. This can be manually re-pressured by a pump below the breech. The breech has a projectile retaining catch to prevent the shell sliding out at higher elevations before it is rammed with a manual rammer. Top traverse totals 58° and the vertical elevation range is −5° to 45°. Box girder section split trail legs are hinged to the cradle support, with bolts to lock them into either the open or closed position. The cradle support also has a bolt for locking the barrel in the centre for traverse before towing the gun. Large spades are permanently fixed close to the end of each trail; these are hinged and it appears that the gun can be fired with them up or down depending on the terrain, but they are always up when the gun is towed. To assist with all-round carriage traverse, there is a pivot jack mounted at the front of the cradle support. The pivot jack is not a sole plate and the gun fires with its foam filled rubber tyred wheels supporting the gun on the ground. When the gun is brought into action, the pivot jack is folded down and adjusted to be on the ground. If a large traverse is required, small jacks on each trail leg are rotated downwards, and the trails jacked up until the main wheels are lifted clear of the ground and the bogey wheels mounted on each trail leg swung downwards and the trail jacks raised, the carriage is then traversed, and the trail jacks re-used to lift the bogey wheels and then place the piece back on its main wheels. The pivot jack is also used to secure the barrel against vertical movement when the gun is being towed. The barrel is locked in the centre for traverse with a bolt on the cradle support. The jack is folded upwards, lugs on the ring cradle engage the jack base and two tensioners fixed to the saddle support are hooked to the cradle, these are tightened to lock the cradle onto the jack base. As was normal for the period, the gun has a shield, including a folding piece below the cradle support. The centre section of the upper shield slides both up and down and folds to accommodate the barrel at higher elevation angles of fire. The shield may offer some protection against muzzle blast to the sights and layer, although it is usually shown being fired with a long lanyard, but is probably mostly for defence against machine gun fire. The non-reciprocating sights are standard Soviet pattern, designed for one-man laying. Included are a direct fire anti-tank telescope (OP4M), a panoramic periscopic indirect-fire sight, a dial sight, (PG1M) in a mounting, an angle of sight scale, and a range drum for each charge engraved with the range (distance) scale, coupled to an elevation leveling bubble mounted on dial sight mount. The range drum enables the standard Soviet technique of semi-direct fire when the piece is laid visually on the target and the range set on the range drum. Like most Soviet artillery, the gun fires separate ammunition using metal cartridge cases that also provide obturation. The ammunition is interchangeable with that used with other 152 mm guns, although the more modern ones also have a third, much larger cartridge. The D-20 uses two types of cartridge; one has a base charge and up to five increments, the other is a single 'super' charge cartridge. The standard shell weight is 44 kg with a muzzle velocity of 655 m/s, but some projectiles are more or less than this. The basic shell is HE-Fragmentation, other projectiles include smoke, illuminating, chemical and probably incendiary. Later projectiles include bomblet, anti-personnel mine, flechette, Krasnopol precision munition, communications jammer, and extended range HE using rocket assistance (RAP). The normally maximum range is 17.4 km, RAP being greater. Two direct-fire anti-tank projectiles have been used, HEAT and APHE, the latter being 5.2 kg heavier and with a lower muzzle velocity. The maximum rate of fire is usually stated as five rounds/minute, and 65 rounds/hour sustained. In Soviet service, the unit of fire was 60 rounds. The detachment was either 8 or 10 men, probably differing between armies and the time period. In Soviet service, the 5,700 kg gun was usually towed by a URAL-375 6×6 truck or, in some regions, an AT-S or AT-L medium tractor. The Khitin is an improved version with an automatic rammer for an increased firing rate of 7-8 rds/min. Type 66 – This is the licensed version of the D-20. The improved version is known as the Type 66-1. Type 83 – Self-propelled version of the Type 66, very similar in layout to the 2S3. The US Defense Intelligence Agency has reported the existence of a number of self-propelled artillery systems, mating existing cannon systems with a locally designed chassis. The SPH 152mm M1974 appears to be the D-20 or Type 66 mounted on a tracked chassis “Tokchon”. A411 – This artillery system was designed by Arsenalul Armatei and is very similar to the D-20. It has, however, a different 152 mm ordnance, 20.5 calibres long, with a range of 17.2 km (24 km with OF-550 projectile). In Romanian Army service, the A411 is known as the 152 mm towed gun-howitzer M1981 (Romanian: Tun/Obuzier calibrul 152-mm tractat M1981). A412 – License-built Chinese Type 59-1 with a D-20 carriage. In Romanian Army service, the A412 is known as the 130 mm towed gun M1982 (Romanian: Tun calibrul 130-mm tractat M1982). A425 – Another variant that uses the D-20 carriage. Designed in Romania using Chinese technology, and with similar performance to the 2A65 "Msta-B". The A425 has a maximum range of 22–24 km. In Romanian Army service, it is known as the 152 mm towed gun-howitzer M1985 (Romanian: Tun/Obuzier calibrul 152-mm tractat M1985). The system is offered for export as the Model 1984. Gun-howitzer M84 NORA or NORA (Serbo-Croatian: novo oružje artiljerije) – On the basis of construction documents for the D-20 and experience with producing the M114 155 mm howitzer, this new type of weapon with greater range was developed by Military Technical Institute Belgrade. While it retains some elements of the original carriage, almost everything else is redesigned and modernized starting with the barrel, which is replaced by the new L/39.7 barrel. M81 howitzer of the Romanian Land Forces. Iraq — All were destroyed in the 2003 invasion, new models bought from Bulgaria in 2015. Laos — In service as of January 2019. Myanmar — 35 delivered in 2009 from DPRK. Nigeria — 4 M81/M85 from Romanian Army stocks. Romania — The Romanian Army has 247 M81 howitzers and 103 M85 gun-howitzers. East Germany — 137 supplied in 1974-1975, passed on to Germany after the German unification. Finland — 126 supplied in 1965-1967. Known as 152 H 55. Soviet Union — passed on to successor states. ^ Foss, Christopher (1977). Jane's Pocket Book of Towed Artillery. New York: Collier. p. 113. ISBN 0020806000. OCLC 911907988. ^ Ezell, Edward Clinton (1988). Personal firepower. The Illustrated history of the Vietnam War 15. Bantam Books. p. 153. OCLC 1036801376. ^ Military Balance 2016, p. 429. ^ Military Balance 2016, p. 178. ^ Military Balance 2016, p. 180. ^ Military Balance 2016, p. 82. ^ a b c d e f g h i "Trade Registers". Armstrade.sipri.org. Retrieved 5 January 2019. ^ Military Balance 2016, p. 242. ^ Military Balance 2016, p. 438. ^ Military Balance 2016, p. 107. ^ Binnie, Jeremy. "Iraq receives Bulgarian D-20 guns". IHS Jane's 360. IHS. Retrieved 29 July 2015. ^ Military Balance 2016, p. 491. ^ Gibson, Neil; Fediushko, Dmitry (22 January 2019). "Laotian military parades Russian- and Chinese-made equipment". Jane's 360. London, Moscow. Archived from the original on 23 January 2019. Retrieved 24 January 2019. ^ Military Balance 2016, p. 188. ^ Military Balance 2016, p. 406. ^ Military Balance 2016, p. 190. ^ Military Balance 2016, p. 132. ^ Military Balance 2016, p. 354. ^ Military Balance 2016, p. 203. ^ Military Balance 2016, p. 205. ^ Military Balance 2016, p. 297. Wikimedia Commons has media related to 152 mm howitzer D-20. This page was last edited on 28 February 2019, at 08:52 (UTC).